.Image Sensor: 1/3"progressive scan CMOS, 4.0 Megapixels. 【5MP PTZ CAMERA】: 5mp ptz ip camera with 1/3 CMOS , 4.0 Megapixels with intelligent IR illumination & power consumption variable, 6pcs Array LED Lights support IR distance 80M. 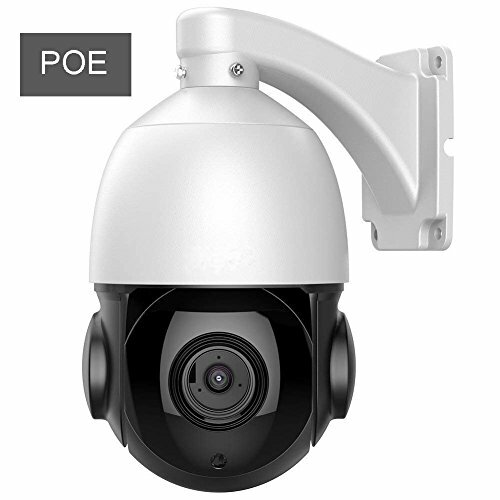 【POE PTZ CAMERA】: Poe ptz compatibility with many NVRs like NUUO , DAHUA , HIKVISION , JUFENG , AEVISION and so on. The better use a power supply, poe support power is not enough for PTZ. 【PAN TILT &ZOOM】: 18x optical zoom Ptz camera Horizontal Rotation Speed is 0.02°/s-60°/s, Horizontal Rotation Range is 360°, Auto Flip ist that Horizontal 180°, Vertical 93°. 【TECHNICAL SUPPORT】:Good qulity and good service, Ip66 weaterproof and CE,FCC,RoHs certification. Also p2p, Support Windows, iPhone platform smartphone and so on. If you have any problems with our product or need some suggestions in installation, you can see the video on the web: https://www.youtube.com/watch?v=zwg-1jXcay8, perhaps contact our support: smithyan001@yahoo.com.